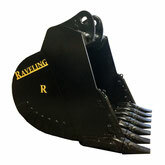 At Raveling Companies, buckets are our specialty. 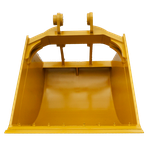 We design custom buckets as well as repair your existing buckets. Whether you're a worm or a hog we manufacture the best designed, highest quality, and longest lasting buckets in the industry today. Our vertical gussets and side wear plates are unique to our designs and extend the life of each bucket we manufacture. When designing attachments, we learn from the problems of our clients. We rethink the basic designs to add durability and reliability to the product.